Looking for a substantial salad for a BBQ? 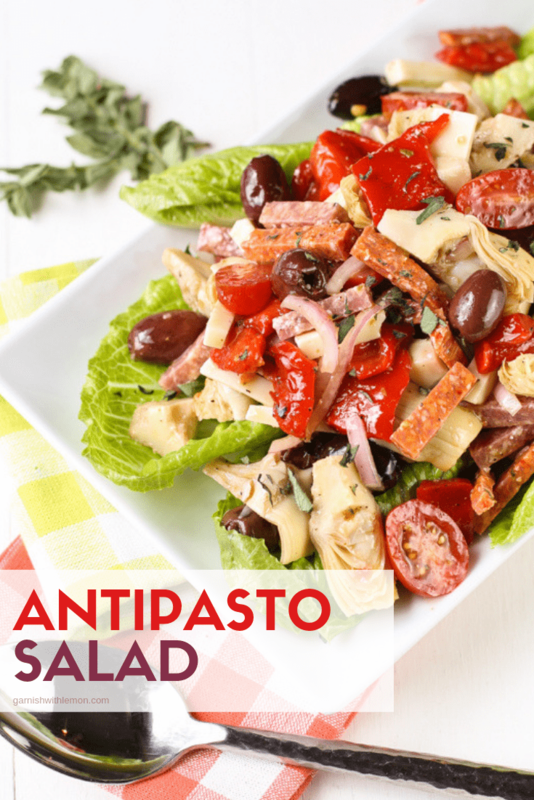 This easy Antipasto Salad is packed with meat and veggies and fits the bill perfectly! A person can never have too many salad recipes on hand for summer gatherings. They are easy to make ahead of time and keep you out of the kitchen when friends are over. Win-win, right? 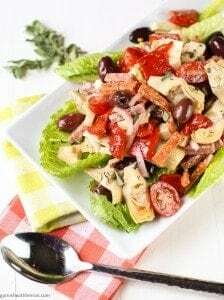 And this Antipasto Salad with Red Wine Vinaigrette is no exception. Packed with meat and veggies, and dressed in a tasty red wine vinaigrette; this salad is substantial enough for a light meal on its own or a great addition to a summer BBQ. 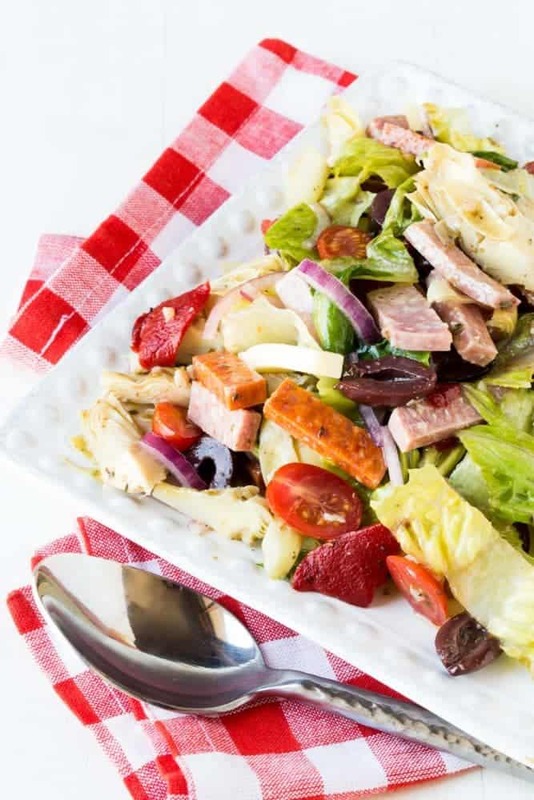 This Antipasto Salad with Red Wine Vinaigrette is devoured by everyone, even those who aren’t salad fans. (Yes, it’s shocking those people exist!) It has all of the good things that people love like pepperoni, tomatoes, olives, salami, and artichoke hearts while still having a little lettuce. Simply pile the meat and veggies on top of a bed of Romaine leaves on the platter, drizzle with the red wine vinaigrette and voila – you have the perfect substantial summer salad! Summer eating can’t get much easier or more delicious. Make-ahead tip: Save on mess and time the day of your BBQ. Clean, chop and slice all of the ingredients the day before and assemble right before serving. Looking for more great BBQ side dishes? An easy salad that is full of flavor! Make sure that the roasted red peppers, artichoke hearts and Kalamata olives are well-drained. Place them in a large bowl. Add the red onion, meats, cheese and tomatoes, Stir gently to combine. Add 1/4 cup Red Wine Vinaigrette and coat the antipasto salad. If needed, add more dressing to get to desired taste. Serve over a bed of romaine leaves. I knew is was National Salad month, but not the vinegar deal. But I think that sounds logical. You know I read the title and thought Ho Hum. But I am going to have to take that back. This is a great salad! Lots of textures, colors and tastes—–yum. I tagged it for my recipe file. Seriously YUMMMM!!! I just made this and it’s delicious! I hate antipasto salads with generic Italian dressing from a bottle. This is great! Thanks for the recipe! I’m so happy you liked it! It’s a favorite around our house! I am totally addicted to all things antipasto. I need this in my life! Thanks, Adam! It’s definitely in our regular rotation! Looks delicious and I love that there are no high-carb ingredients added. Just the good stuff! This looks amazing!! Love the artichoke hearts in there! Thanks for linking to my slaw!